Today our heroic correspondent Stuart Raper writes us with the full report from Montreux Jazz Festival, one of the most prestigious festivals in Europe and beyond. Thanks once more to Stuart for all these updates and stay tuned as he brings us the news from the final few TTB shows in Europe. Fell asleep on the bus somewhere in France, and when I awoke in Montreux, I felt like I was still dreaming. Truly this is one of the most breathtaking places I've ever experienced. Derek and Susan were kind enough to invite us up to their balcony for us all to share in a toast to the lovely Lake Geneva and the peaks that surround it. It was a wonderful welcome into such a beautiful town. Derek has performed here himself but never with TTB, and the crowd ate up every note. At a festival that has hosted some of the greatest performers in history, it is a true honor to partake in Montreux and the band did not take such an opportunity for granted. On top of that, they were opening for Santana, so this was a special proving ground. As always, TTB delivered above and beyond the call. They came out the gate running with a smoking delivery of "Don’t Let Me Slide." It was obvious that Derek's lead riffs were soaring especially high this evening, from the first song in. He broke 2 strings tonight, which is not a nightly event, so that should give an idea of how much fire he unleashed in Montreux. "Midnight In Harlem" started off especially poignant, reminding me of some of the intros I've seen DT play to kick off songs like "Mountain Jam" or "Afro Blue." It began slow and sweet and kept building from there. Susan's vocals glided through our ears, as Mike Mattison, the songs author, and Mark Rivers gracefully harmonized with her. It's just a pretty tune, simply put, with so much depth. Depth and dynamics are two words that come to mind for me on this tour. I've seen so many different aspects of musicianship coming together, highs and lows, ballads and rockers, orchestration and improvisation. Every member on the stage is so good, and so ultimately dedicated to their craft and this project, that the tunes take on new light every show. "That Did It" showcased some of Susan's monstrous Telecaster blues chops this evening, which provoked a smile onstage from her adoring husband. Not to mention her incredibly powerful vocals. Derek tore into "Nobody's Free" riding a thunderous bass line from Oteil, and ended up breaking yet another string. One of my favorites off Revelator, "Until You Remember" nearly brought me to tears this evening. The horn section kicked off the lovely Dixieland-tinged intro as Susan went into her gentle croon. But by the time the chorus came she was belting it out like there was no tomorrow. Meanwhile Kofi played both the organ and piano parts at the same time and Oteil did some incredible chording on his six-string bass, taking it all the way up to the high registers and back. The first time Derek played this tune for me, I was speechless. The amount of deep emotion and power blend with a positive harmony that paints an amazing picture. 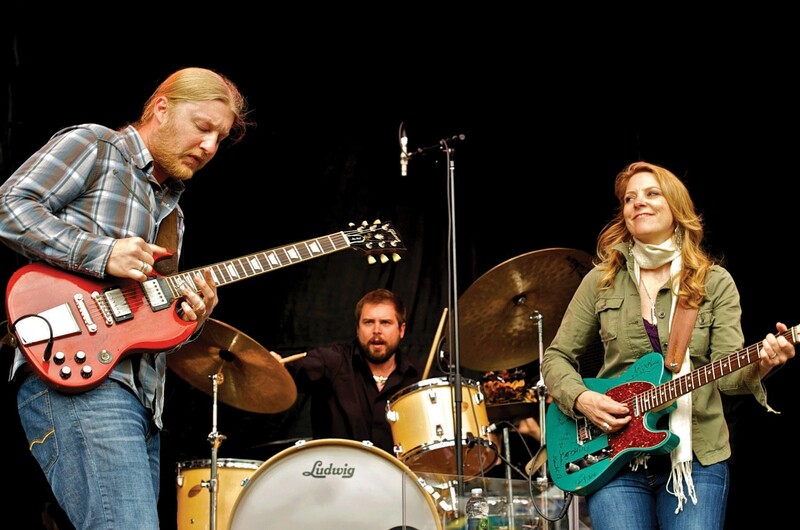 Montreux is a big deal, and the festival welcomed TTB with open arms and splendid hospitality. The band doesn't take this lightly and naturally rose to the occasion. It's not easy to get here in many senses, and seeing musicians like these, who have worked so hard for so long, finally be properly heard is a joy to witness. JJ and Falcon on the drums and cymbals are absolutely mesmerizing to watch. They create such a unique pallet of rhythms that goes beyond any drummer duo that I've ever seen live. They've become dear friends and their chemistry both musically and personally, propels the entire band. Mix that with one of the most stellar bassists on the planet, and you've got yourself a serious rhythm section, a force to be reckoned with. Nobody on that stage is smiling more than Oteil and that is saying a lot. You can often catch him beaming at his brother Kofi and see how they are truly fulfilling their lifelong dreams together. Playing their own music with people who inspire them. Those sentiments ring just as true for everyone in the band, but never more than with Derek and Susan. This project is their brainchild, conceived in their own backyard, but gathered from years of playing so many gigs with so many talented people. They picked their own personal cream of the crop. The magic on that stage is not only felt and celebrated by the audience but by the players as well. The next night Derek and Susan accompanied BB King at his all-star jam, along with Santana, John McLaughlin, Robert Randolph, and many others. Susan and Derek sat right next to BB and it was obvious the mutual love and respect they all have for one another. TTB's own Maurice Brown jumped onstage as well and BB referred to him over the mic as "red hot" and he wasn't joking. After many years of hearing Montreux's legends, it was an honor to partake in such a world-class festival and I couldn't have been more proud to be there with the Tedeschi Trucks Band. Next stop, Stuttgart. Stay Tuned as we Revelate Overseas!